Color coated cutlery sure is the trend and the technology has been improving in leaps and bounds. The quality is improving and the costs are dropping. 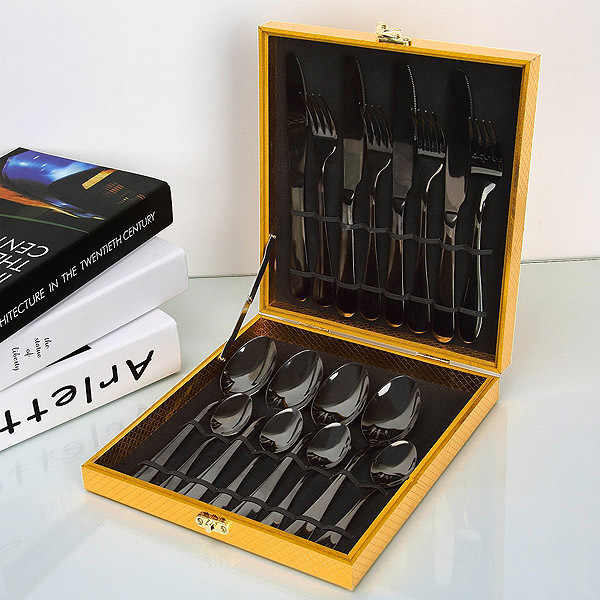 This Catnee Mirror Black Flatware is 16 pieces which is a setting for four. This includes 4 tablespoons, dessert spoon, dinner knife, and fork. It is made of 18/10 stainless steel with a matte black finish. They do warn to use a neutral detergent to wash, do not use strong alkaline or strong oxidizing substances such as baking soda, bleaching powder, sodium hypochlorite.